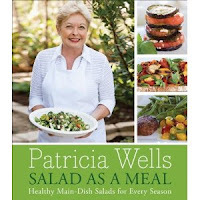 Patricia Wells is my French culinary hero(ine). I own most of her cookbooks, which are primarily focused on Provencal and French cuisine. I'm chomping at the bit to get my hands on her soon-to-be-released Salad as a Meal: Healthy Main Dish Salads for Every Season & was fortunate enough to be selected along with eight others to participate in her publisher's cookbook challenge- which lands me an advanced copy. Yipppeee.... Thanks to William Morrow Publishing (and Patricia, first name basis since we will be social media buddies) for whom we'll undertake to make the recipes then blog, Facebook and tweet about it, offering photos and commentary. BONUS--I'll have a few copies to give away to those who follow the blog. Details to be announced. This couldn't have come at a better time since Kevin and I have recommitted to fitness, golf and eating healthier. In fact, we spoke the words out loud. Literally, "we should have more salad as meals." The universe was listening. Five minutes later, I spotted this challenge on Patricia Wells's FB page and applied. Again, timing was everything as the application cutoff was only two hours after I first saw the post. Decisions would be announced the following day. Appropriately enough, an acceptance email came to my phone while at the gym that morning. VOILA! I'm in. This is the first of what will be many blogs about....well, salad. I hope my foodie friends will follow and comment. 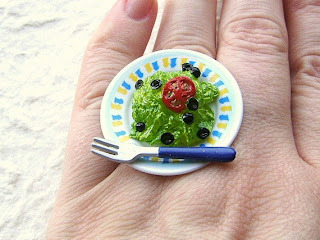 Perhaps, even come over to help muster up a Salad as a Meal. What I particularly appreciate about Patricia Well's cook books is the well-written narrative and her ability to make extraordinary restaurant recipes approachable at home. But, given her unyielding and meticulous attention to technique, an extra set of hands or two might be helpful. We shall see with this cook book. Blogging officially begins March 21. "Will work for salad"